November 30th, 2014 | Written by: Editor | Contributor: Guy Patron, Sr. The Holy Cross Tigers (photo left) placed eight wrestlers in the finals and came away with eight titles at the 2014 Spartan Open at East Ascension High School on Wednesday. Chris Zea, Beau Bush, Collin Guerra, Joey Foret, Jake Rando, George Benoit, Brice Duhe and Travis Gardner were the winners for Holy Cross and Jeffrey Argrave placed third as the Tigers scored 222 points, 95.5 more than Catholic (126.5 points), which took the runner-up spot. The third through fifth place team spots were decided by less than six points: Live Oak placed third with 105.5, followed by St. Amant with 103 and Rummel with 100. Three wrestlers, Rummel's Robert Fairchild, Live Oak's Brody Bonura and Catholic's Nicholas Cashio, claimed their third tournament titles of the season. Dutchtown's Kaleb Faul notched his first championship, as did Brother Martin's Travis Viener. 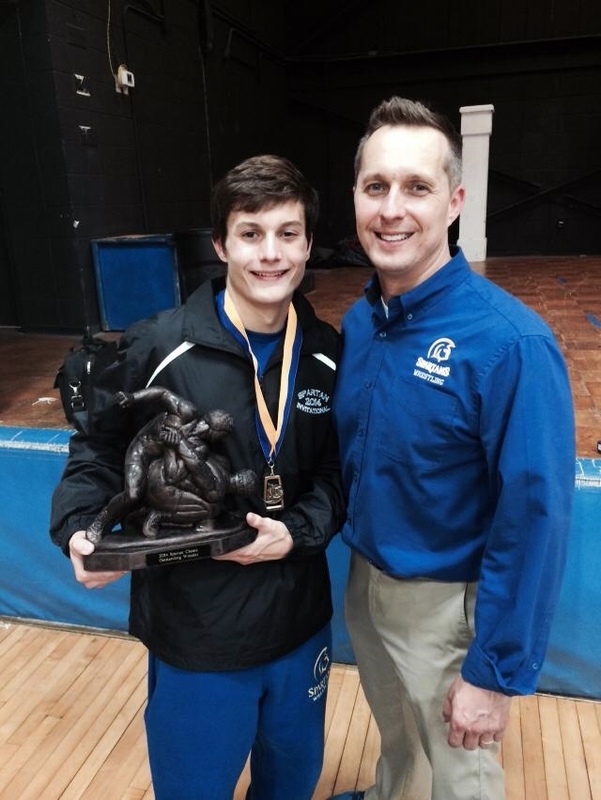 East Ascension's Jacob Bernard won his second championship of the season in the 132 pound weight class and was voted the tournament's Outstanding Wrestler (photo right with father and coach Mike Bernard). Seeding Implications: December is not a banner seeding month for determining seeding for January's Louisiana Classic and Ken Cole Invitational, much less for the state championships in February. A lot of programs either travel out of state or are entered in events in which they may not face a lot of Louisiana competition, such as the Trey Culotta and the Deep South Bayou Duals which are replete with out-of-state teams. Brother Martin goes to Tennessee for the Blackhorse in early December. Jesuit, Rummel and St. Paul's will be in Destin for the South Walton Border Wars during that week. Catholic and Brusly are going to the Beast of the Beach in Fort Walton in the second week of December and Holy Cross is again venturing to Las Vegas the weekend before Christmas. Jesuit does host Brother Martin in a dual meet on the 13th, and the Catholic Duals on the sixth will have some formidable teams, but any dual meet results should be superseded by November's tournament results. Yet it is never too early to speculate and November has provided enough information to start. Hence, following the Spartan Open descriptions on each weight class page will be seeding speculation based on the results of November's competition results. The event was efficiently run by Mrs. Linda Guidroz and Mr. Jeff Mire; on hand to support father Alan (their official father?) were sons Mason and Cameron Prejean; Kynan Sonnier of Teurlings Catholic (right) warms-up Live Oak's Brody Bonura before the finals; Comeaux royalty were in the house in the form of 2012 and 2014 state champions Jacob Dale and Connor Stampley; an assistant timekeeper is armed and ready for action.